Tarrah von Lintel began her career in Paris, working first with Galerie Claire Burrus and then Thaddeus Ropac before opening her own gallery in Munich in 1993. Her gallery featured many NY artists, some of whom she continues to represent today, leading to her move to NYC’s growing Chelsea district in 1999. After 15 successful years in NY, the gallery relocated to a much larger space in the burgeoning Culver City arts community, in recognition of LA’s growing importance on the international art scene. 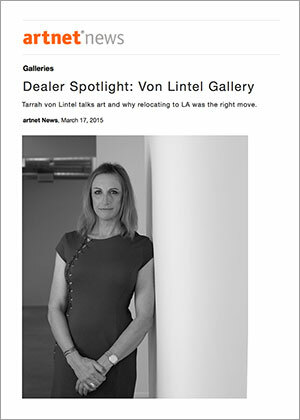 A Interview with Tarrah von Lintel in artnet news.